Green lentils or Lentilles du Puy work well for this salad. This dish is very nourishing and can be served to athletes regularly because it is rich in iron, and especially when carbo-loading as an alternate to pasta. The recipe below can even be made with half lentils-half rice to be eaten 4-5 hours pre-race for endurance events. Lentils take a while to cook, they have to be boiled on medium heat in a large pot (not in the pressure-cooker as it might clog) with a bayleaf.. I rinse them first, but they don’t need to be soaked unless you need to reduce cooking time maybe when camping. When the lentils are ready, still firm but cooked through, drain them well and then, you just add the dressing. 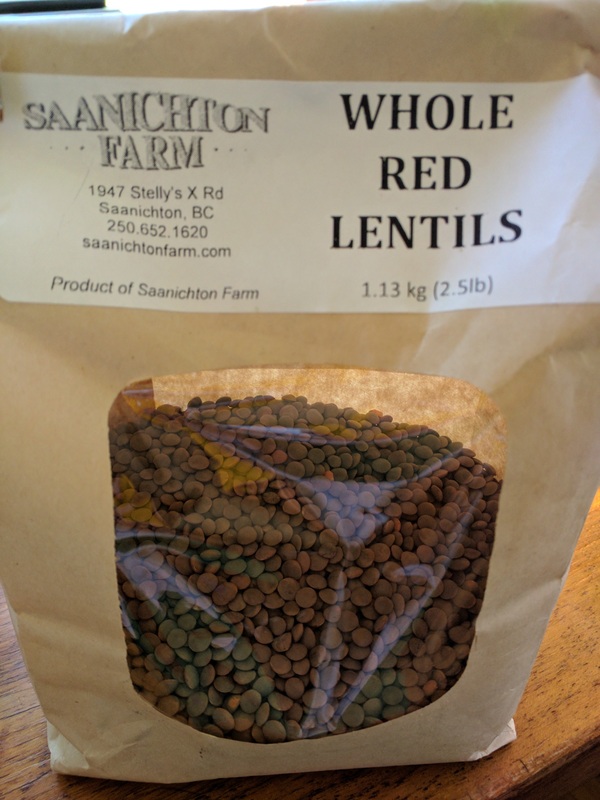 For 2 cups of raw lentils (6 to 8 servings), add one crushed garlic clove, half a sweet onion finely chopped or 3 green onions, 1 tbsp Dijon mustard, 2 tbsp wine vinegar, 1 tbsp cider vinegar or lemon juice, 4 tbsp oil of your choice, a few drops of hot sauce, Baleine sea salt and fresh ground pepper. Lardons or bacon bits are optional, not recommended pre-race. But, a sprinkle of chopped parsley or chives is good anytime. This is a nice side for a ham roast as well, or can be served with a boiled egg as a lunch. It saves well and can be eaten cold the next day. 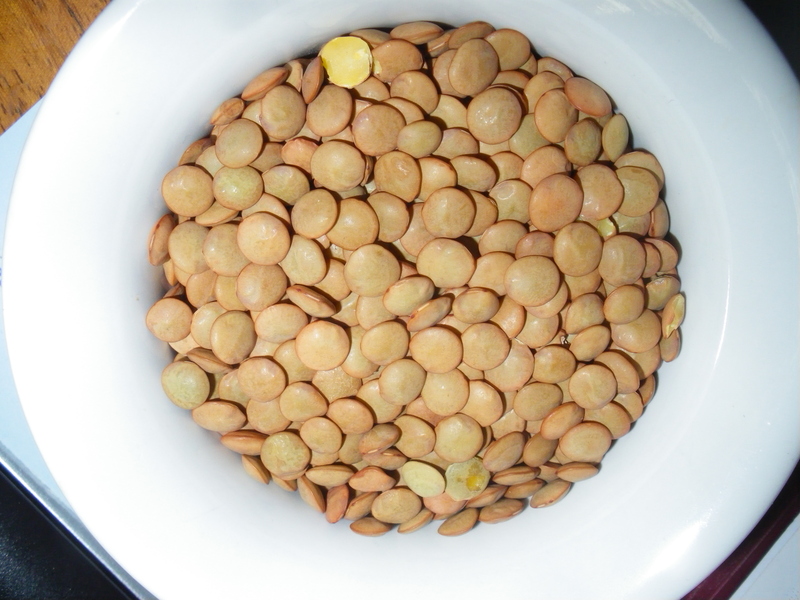 The same recipe goes using small whole red lentils such as those in the picture below. This entry was posted in Starter and tagged athlete, carbo-loading, cider vinegar, Dijon Mustard, lentil, lentil salad, maille, recipes. Bookmark the permalink. Hey : Funny you emailed… we were chatting about you and Db last night about 2 1/2 hrs into a 3.5 hr ride at the Ganaraska. The conditions were amazing… it was as fast a ride as I have had in a long time. How are things out west? Your blog is very amazing. Hey I was out last weekend digging up some ramps. I froze most of them but still have about a lb fresh in the fridge. Have you ever cooked with them? Tc, and say hi to Dunnery and the kids for me. No, I don’t know what do to with the wild leeks. We don’t have them in BC, I don’t think. I found a recipe on the net. You should be picking nettles right now, so healthy and delicious, see earlier recipe on the blog from my grand-mother in France, we use to pick them for her as kids.